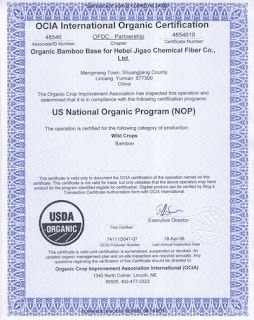 The bamboo from China has now been certified organic by OCIA International (Organic Crop Improvement Association) and USDA/NOP (US National Organic Program) for the growing of the bamboo. See below for certificates. To celebrate peek a green's opening, we are launching an exclusive bamboo collection. Bamboo is called the eco-fiber of the 21st century. It is naturally organic and it is the most renewable resource on our planet. Why Bamboo is Perfect for a Baby's Sensitive Skin and the Environment? 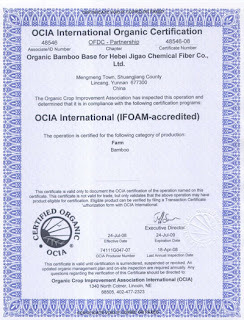 -Naturally organic: Bamboo is grown without pesticides and fertilizers. -Sustainable: Bamboo is arguably the most renewable resource on our planet. It has an extensive rooting system and needs little water, growing 4–6 new shoots per year. It is, in fact, considered to be the fastest growing plant in the world. -Eco-friendly: Bamboo absorbs nearly 5 times the amount of greenhouse gases and produces 35% more oxygen than the same amount of trees. It is critical in the fight to end global warming. Bamboo is rain-fed only and helps to reduce soil erosion. It is a grass, so it regenerates without the need for replanting. -100% biodegradable: Bamboo fiber comes from nature and it returns entirely to nature in the end. -Absorbent: Bamboo is highly absorbent and wicks water away from the body 3 to 4 times faster than cotton. In warm, humid weather, bamboo clothing helps keep baby drier, cooler, and more comfortable. Another advantage is that bamboo fabric doesn’t stick to the skin. Bamboo fiber and fabric require less dye than 100% cotton fabric because bamboo has a better absorbency than conventional cotton. -Antibacterial: Bamboo is naturally anti-bacterial and anti-fungal presumably because of a bacteriostasis agent unique to bamboo plants called, "bamboo kun," which also helps bamboo resist harboring odors. UV resistant: Bamboo fiber does have natural UV protection. According to the Suncare Research Laboratories, the UPF label rate is 15. The 100% bamboo fabric scored 18.3 on the UPF scale with 94.15% UVA block and 93.17% UVB block. -Hypoallergenic: Bamboo's organic and natural properties make it non-irritating to a baby's sensitive skin. -Luxuriously soft: It is often compared to silk or cashmere, but easier to clean (washer and dryer safe). The fibers won't peel, making it safer for babies. peek a green is launched! Welcome to peek a green tm blog! Today is the official launch of peek a green tm: green baby gifts handpicked for a better world tm. My daughter Sasha was my inspiration, the lack of safety for baby products was my motivation, and my entrepreneurial spirit was my determination to launch peek a green tm. peek a green tm has handpicked the most baby-friendly and eco-friendly products and created unique baby gift sets for all occasions: from eco-shower to eco-birthday gifts. For each item you purchase we will have a tree planted thanks to our partnership with Trees for the Future. We have found some hidden treasures so let's start playing peek a greentm! Thank you for your support. At peek a green tm you are not only buying safer products for your babies, your relatives' or friends' babies but also contributing to make a greener future for our children.